Important Notice: Lithium-Ion Item - Express Delivery option not available due to transportation regulations.The M12 FUEL 5/8 in. SDS-Plus Rotary Hammer Kit provides up to twice run-time, up to 75 percent more speed and has the largest SDS-Plus bit capacity in its class. 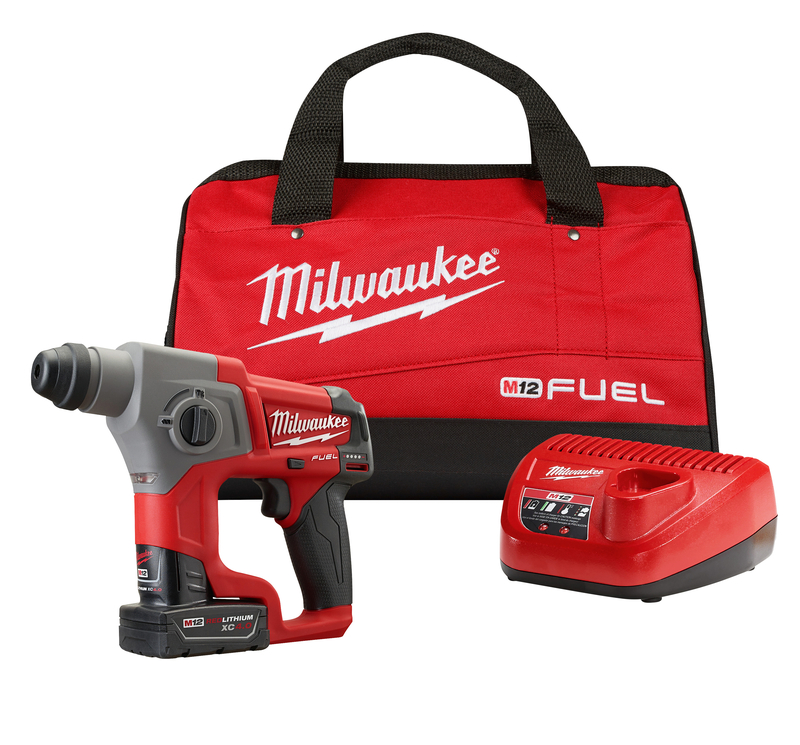 Milwaukee has combined their exclusive POWERSTATE brushless motor, REDLITHIUM battery pack, and REDLINK PLUS intelligence to deliver a 12V rotary hammer that rivals compact 18V tools on the market today. At only 10 in. long and 3.9 lb., this tool provides performance and run time that is comparable to a much larger tool, at a fraction of the size and weight. The electro pneumatic design allows for drilling of up to 5/8 in. holes in concrete and masonry. For maximum versatility, regardless of application or orientation, the tool also features 2-mode Operation, Rotary Hammer and Hammer-only. Use for drilling holes in precast concrete for anchors. Works perfect! Works great on concrete, precast, and block. super light weight and more power than i expected. Had to drill through high strength poured concrete walls of elevator shafts and drill many smaller holes to hang conduit . This monster out preformed my makita 18v lxt hammer drill in both speed and longevity. I was amazed at the battery life with as much as i used it . Only used it on a couple jobs so far but i am impressed as were the guys on the jobsite. I'm an electrician, and I love this new hammer drill. I can't believe how much power it has. I would recommend this to any one looking to drill holes in concrete. I use this everyday to hang conduit on walls. Mainly stucco but it tears through solid stemwalls fast and clean. It's my first cordless rotohammer and a 12v for that. It was plenty of power for what I use it for. Battery lasts 3-4 days. The only thing I hate about it. The reverse switch sticks out the side of it and if you lay it on its side the switch gets pushed and not its spinning the wrong way. I know it was intended to be placed standing on the battery but no one has the time to place the tool down. Most of us just put it down however it may land. A belt hook would be nice too. Works great for a small job, Instead of running a hundred foot power cord, it is ready to go with a charged battery. Its very powerful for its size. Used it at a hospital. The concrete I so dense and hard that I had a hard time drilling a quarter inch hole with an 18 v hammer drill, this SDS 12 v drilled through it like butter. What's the biggest hole this unit will drill? BEST ANSWER: i use mine to mainly drill 1/4 rawl plug holes. The drill will hold any sds bit. red blick and block i drilled a 1-1/2 hole 18". The battery lasts quite a while. Does this drill accommodate a handle? BEST ANSWER: This drill does not come with or accommodate a side handle. does this have a chisel mode? BEST ANSWER: The 2416-22XC has 2-Mode operation lets the user choose from rotary hammer or rotation only for maximum versatility, but it does not have a hammer only mode. does this kit come with 4.0 fuel batteries as pictured?? BEST ANSWER: The kit does come with two (2) 4.0 ah batteries.